Place lemon zest, orange zest, flour , black pepper, and chili powder into a shallow bowl and combine well. Pat dry tilapia fillets and place into the seasoning coating both sides well. Melt 2 tablespoon butter in a large frying pan over medium hi heat. Place Tilapia fillets in pan and saute 5 to 6 minutes turning once. Both sides should be a nice golden brown. 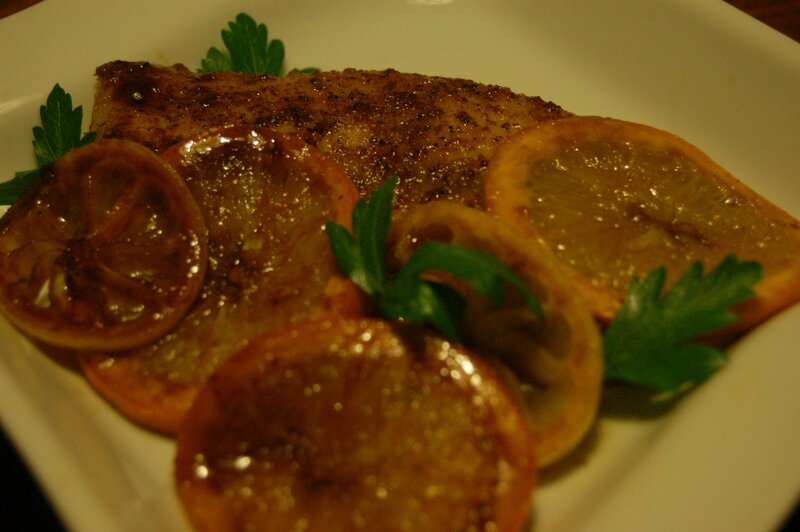 Remove fillets from pan and add a tablespoon of butter, garlic, lemon juice and orange juice. Cook for 30 second then add lemon slices and orange slices. Sprinkle with brown sugar and cook over medium heat for about 2 to 3 minutes or until they start to caramelize. Add tilapia back to the pan and coat well with pan sauce.